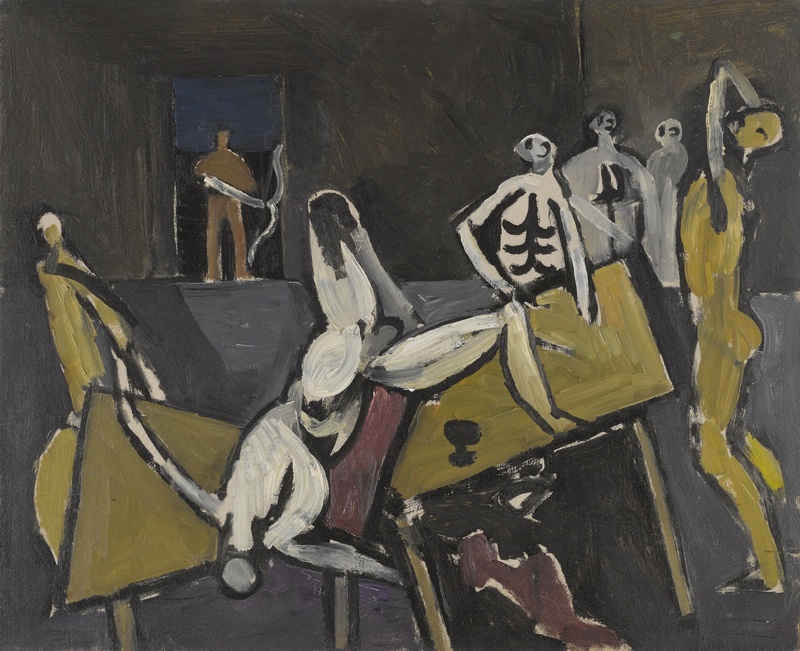 Vaughan painted several works around this time based on Classical myth and legend (see Theseus and the Minotaure, 1950 and Theseus, for the Dome of Discovery, 1951). It was his habit to explore pictorial possibilities in drawings, gouaches and oil sketches before embarking on a final version. The process assisted him in resolving problems such as figural placement, composition and colouration. Study for The Return of Odysseus may have originally been the preliminary workings out of an intended full-scale work that was never translated into a resolved painting. The narrative comes from Homer’s Odyssey. It deals with the moment Odysseus returns to Ithaca after the Trojan Wars, disguised as a beggar, to find his palace overrun with suitors. His wife Penelope has arranged to marry whoever is able to take her husband’s great bow and fire an arrow through the eyes of twelve axe shafts. None of the suitors are able to even string the taut bow, let alone fire it. Only Odysseus shoots an arrow successfully. Study for The Return of Odysseus depicts the moment after this incident – when the hero wreaks his revenge. Vaughan’s management of the narrative is as intense as anything he painted. Odysseus appears at the door of the palace, bow in hand and begins the systematic slaughter of the suitors one by one. First he kills Antinous who, he discovers, is drinking from his own goblet. The force and speed of the execution sends his rival reeling and shatters the table in half. Vaughan is careful to include Odysseus’ goblet in the scene. The others have had little time to react, and are just beginning to realize the fate that is in store for them. The figures of the suitors are distorted for expressive purposes and Vaughan’s approach to anatomy is informed by his life-long study of the male form. The handling of the pigment, which communicates much of the dramatic force of the image, is both bold and animated and gestural brushstrokes contribute to the drama of the scene.